The first quarter ended on a happy note with the S&P 500 index finally reaching the two top high points set in both March 2000 and October 2007. It took the stock market 5 1/2 long years to regain the 56% drop suffered during the ‘Great Recession’ of 2008-2009. On the other hand, the typical Pring Turner client recovered and achieved new all-time portfolio highs in 2010 and subsequent new highs in every year since. The U.S. stock market currently sits near levels first reached almost fourteen years ago. It has certainly been a wild financial roller coaster ride for investors. Buy and hold has not been a winning strategy this century. Success has been best achieved by having a plan to both grow assets during the bull markets and a serious plan to protect portfolios during the ride down in bear markets. The core proactive investment strategy at Pring Turner is to carefully pay attention to business cycle swings (especially important during recessionary periods) to manufacture returns while reducing risk through the normal ebb and flow of the economic cycle. In March the stock market also celebrated its 4 year birthday making it quite mature for an average cyclical bull market. At this late stage we are still optimistic but watchful for signs of any change to our outlook. Our cautious optimism is tempered by the observation this business expansion and accompanying bull market have been fueled not so much by genuine underlying business demand and prosperity as it has by unprecedented money printing (QE I, II, III…) by the Federal Reserve. In prior recoveries, the economy needed just a little monetary ‘oxygen’ provided by the Federal Reserve to kick start a recovery. This economy has instead been on full life support for four years experiencing the weakest post-War recovery yet and the Fed has announced it will continue to provide life support for another year or two. The patient is alive but apparently not yet able to sustain itself without additional intensive care. The big question is what happens when either the Fed takes away the oxygen hoses or the economy slips into the next recession without having fully recovered or improved the employment situation? Or, what if inflation jumps above tolerated threshold levels? These are issues we will stay focused on and stand ready to shift portfolio tactics as the economic environment changes. As we theorized in our January client letter and confirmed in our February portfolio update, the economy as measured by our Barometers has indeed advanced into Stage 4. Historically, Stage 4 is particularly kind to natural resource type companies. So far though, we have yet to see natural resources like metals, mining and energy companies begin to outperform other sectors, but we fully expect that to occur as we move through Stage 4. Shorter term, we believe the four year cyclical bull market for stocks is not finished, but perhaps getting too stretched to the upside. After a five month rally the stock market is entitled to take a short rest. Expect stocks to correct some of the recent gains and retreat in price. However, our business cycle research shows evidence of a continued modest, yet positive, economic momentum. This allows the stock market further upside potential as the year progresses. We will be searching and evaluating additional conservative growth and income ideas to purchase on weakness. Our goal is to see your portfolio achieve further new all-time high levels later this year. Longer term, one potential major catalyst that could propel the stock market even higher in 2013 could be the return of the public stock investor. 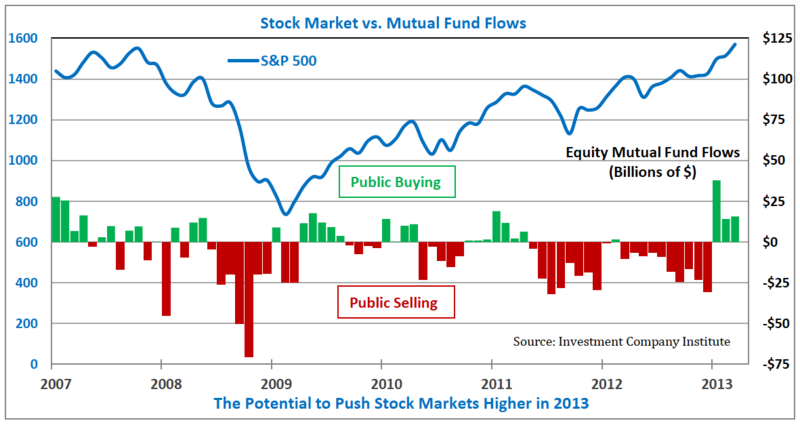 The chart above illustrates mutual fund money flows, an indicator of public interest, and shows investors since 2007 have consistently pulled money out of stock mutual funds until very recently. Investor confidence is finally re-building and positive stock fund flows are an encouraging sign the cyclical bull market can extend. If and when the public gets too carried away we will become more concerned. Pring Turner’s number one priority has always been to provide you positive portfolio returns with limited downside risk and volatility. We are proud to say we have delivered on that priority over our entire 36-year history. Protecting portfolios through the inevitable bad periods is a key to your hitting new high levels of wealth soon after any market correction or bear market ends. Rest assured, each day the team at Pring Turner is working hard to continue and improve upon our long-term performance history. Speaking of the Pring Turner team, we recently added some talented legal professionals to help us maintain the highest ethical and regulatory standards possible. Stefanie Little and Daneen Downey of SEC Compliance Alliance are working with us to oversee and administer all elements of Pring Turner’s far reaching compliance program. Stefanie is stepping in to assume the important responsibility as Pring Turner’s Chief Compliance Officer. We are so pleased to welcome this talented duo of attorneys who have extensive experience working with investment advisors. Their guidance has been especially helpful to us as we launched our own actively managed ETF, the Pring Turner Business Cycle Fund (DBIZ) last year. Their combined expertise was essential in our ability to meet the heightened regulatory oversight placed upon 1940 Act mutual funds. Welcome to the team Stefanie and Daneen! We would also like to welcome all new clients to the Pring Turner family and we look forward to a successful relationship over many years. Thanks to everyone for your trust, confidence and the opportunity to help you. As always, please feel free to contact us should your circumstances change or if you have any questions.